It can only happen in Kerala! 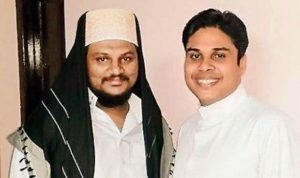 The congregation attending Friday prayers at the Juma Masjid were astonished when Imam Azhar al Qassimi cut short his Friday sermon, and gave the floor to a catholic priest. Surprise turned to amazement when the faithful saw a man in a Christian priest’s robes walking in. The man was Fr Sanu Puthussery, vicar of St Antony’s Church in Vechoor, Kottayam. The priest from the Syro-Malabar Church walked up to the podium, which the imam quickly vacated, and for the next eight minutes, addressed the 250-odd Muslims. “It was an unbelievably holy experience,” Fr Puthussery told the media. The event is considered a milestone in communal amity and just the inspiration a flood-battered Kerala needs as it inches towards normality. The imam asked him to wait through the Friday prayers, kept his sermon short and left the floor to the Catholic priest. Faced with a food shortage for the 2,000-odd people sheltering at the church, Fr Puthussery had approached the imam on August 17. He “mobilised food, medicines and volunteers” till the families left nine days later. After the floods, Muslims youths have cleaned up temples. A church and a temple were thrown open for Muslims to offer Bakrid prayers as their mosques were under water. Yassar Arafat, who had led a group of Muslim volunteers in rescue and relief and helped at the church, said the vicar’s address was “a moment everyone at the mosque would cherish through their lives”. The man who shared the story on Facebook, Niyaz Nasar, said he had just happened to be at the Vechoor mosque although he usually goes to another mosque. “Perhaps I was destined to be the messenger to reach this story to the world,” an emotional Nasar said.